Series 5TM and the Series 5 FanbackTMare the only chairs of their kind completely made in the USA! McCourt is the only U.S. manufacturer of the stackable folding chairs. These chairs are lightweight, sturdy, and offer low pricing. Each chair weighs less than 7 lbs, customers can expect the ease in versatility. In the process of setting up events for school graduations, music concerts, sports events, and special ceremonies, Series 5 provides design with function. Small details make a big difference: custom designed high strength rivets, not screws; taper crimped braces; drain holes for a dry seat and optional hot stamp I.D. The lightweight design is easily movable from storage to event. Stacking up to about 50 – 100 high, storage space is a minimal concern. Made from U.S. steel frames, the Series 5 chairs are long lasting for continuous event reusability. McCourt also offer chair dollies that can help move up to 50+ stacked chairs. Fitting through standard doorways, chair dollies just make it easier to setup and maintain storage. Frames for the Series 5 comes in painted or chromed with seat and back painted from our color selections. Please check our website about the Series 5 color selections or call us and ask about receiving any color samples. We feel it is important our customers have an opportunity to best fit the chairs to compliment their event. Additional options include a custom hot stamp of your company or school name. 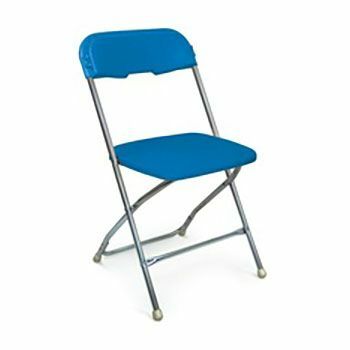 McCourt Series 5 folding chairs offer an affordable pricing because of our bulk purchase toward available volume discounts. These chairs are perfect for outdoor events; the back braces even come standard with bottom drain holes to prevent moisture entrapment within the joints. Having been tested the weight capacity of up to 275 lbs, the Series 5 are strong and durable without sacrificing comfort. The chairs are designed with the audience in mind; comfortable sitting is not a problem at all during any event. Seat and back contain Polypropylene that provides anti-static and UV protection. The tubing is pretreated in a 5 stage acid cleaning and phosphate surface treatment for enhanced corrosion resistance and preparation of the tube surface for maximum molecular bonding of the powder coating. This lets you know the Series 5 are weather resistant to maintain the paint’s smooth and glossy finish. Series 5 - .75” dia. x .038” thick wall in HSLA (High Strength Low Alloy) tubing is the industry leader in light weight and high strength chair frame work. All tubing is rolled on the foot end for durability. Punches and bends are precision controlled with dedicated proprietary equipment. Braces of .625” x .023” thick cold rolled tubing precision bent and crimped with proprietary ends to prevent moisture entrapment in joints. Back brace comes standard with bottom drain holes. Rivets are semi-tubular, zinc plated. Brace and back rivets are 3/16” diameter, all others are ¼”. Seat retaining plate is .038” thick CRCQ steel and seat support clips are designed to give the optimum seat attachment performance. Series 5 - Tubing is pretreated in a 5 stage industrial cleaning treatment for enhanced corrosion resistance and preparation of the tube surface for maximum molecular bonding of the powder coating. Baked-on polyester powder coating has outstanding toughness, excellent weathering properties and a smooth, glossy appearance. For chrome frames, all parts are chromed before assembly with a 4 stage cleaning process then are duplex nickel plated, chrome plated and double rinsed to remove plating residue. Series 5 - 6.75 lbs. Ships in 70 lb 10 pack or 710 lb 100 pack on pallets. Series A5 - 5.5 lbs. Ships in 57 lb 10 pack or 580 lb 100 pack on pallets.